Stroll through enchanting Hana Tropical Gardens and enjoy the aromatic tropical flowers. Take a splash in the ocean at a black sand beach, or a dip in a freshwater pool at a cascading waterfall. Travel the Road to Hana in a limo-van and return by helicopter via thee Haleakala Crater. The raod to Hana is beautiful, no doubt, but doing it with Scott, our tour guide made it a truly magnificent experience. He knew where and when to stop and take amazing pictures, even suggested camera angles and settings for the best effect. He gave us history, natural wonders and even the best food and rest stops. They gave us a delightful ocean side lunch and then a swim in the black beach. The helicopter than swooped us up for a swift aerial view back to the heliport. This tour was definitely worth the money. Our pilot and driver were both very friendly and knowledgeable. We had a great day, beautiful weather! The tour is kept on schedule, a lot to see. Scott was our tour driver, Very knowledgeable and a great photographer with your camera or smart phone! Awesome and wanting more!! The ride up and guide Wendy was as good as the Blur Hawaiian helicopter trip back which was unbelievably gorgeous! Great people and experience all around!! This was a perfect way to see the Road to Hana. It was relaxing and a good balance of stopping to see things and enjoying the commentary from the driver. The helicopter ride back was outstanding. Excellent tour!! Would highly recommend to anyone! Helicopter was amazing and thrilling and the Hana tour and stops along the way back were awesome. Our guide Scott was extremely good and wanted us all to really enjoy the day. Our tour guide was great and very knowledgeable. The helicopter portion was shorter than listed and we did not get to see the top of the crater because of clouds. Which apparently is a common occurrence. 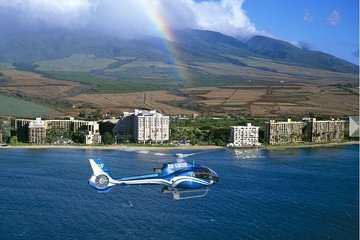 This was the finest way to travel to, see and return from Hana - This Hana Luxury Tour and Helicopter Flight was exciting and comfortable. Our helicopter pilot Hugo made our flight one for the memory books and our tour guide Wendy was super accommodating and fun. Our meal service was first class. This tour is HIGHLY RECOMMENDED! !